Good gardening is about harmony with nature (although maybe not slugs), the Botanic Nursery gives you everything you need to grow great plants. Here you can find information on the large range of plants we grow, general gardening advice and purchase our plants and seeds online. We are proud to hold the national collection of foxgloves as well as a wide range of plants, rare shrubs and garden favourites such as hollyhocks, Asters and and Peonies including those from the Jim Archibald collection. On our site you can find inspiration and advice on general gardening and growing from seed as well as our wide range of plants and seeds available to buy online. We hope you enjoy browsing. We aim to continually develop this site to offer useful gardening advice and seasonal tips on a range of gardening topics as well as bring you all the latest news and information from the Botanic Nursery. If there is anything you would like us to add please let us know via our email. If you like what you see why not give the nursery a visit! If you are planning a nursery visit we are open Tuesday-Saturday 9.30-5 (10-4 Saturdays) from 10th March. We are closed in winter except by arrangement. On Sundays or if making a long journey please call ahead to arrange a visit: T:07850 328756. During Foxglove (2016 Foxglove Week 27th May to 1st of June) Week the nursery is open everyday 9.30-4.30. The foxglove tour will take place each day at approximately 2PM. The Botanic Nursery is Europe’s leading authority on Digitalis (Foxgloves) and holders of the National Collection for Plant Heritage. The plants and seeds we offer are the finest forms available, if we can advise on planting or cultivation please ask. The foxglove, so much a part of our British Countryside, is perhaps one of the few native plants to be well received in gardens. They do seem to have the ability to spring up almost unnoticed that is until their towering stems dominate the garden. Once there few gardeners have the heart to remove them, thus ensuring more in future seasons, for foxgloves are great seeders. Most foxgloves prefer a well-drained good garden soil in full sun or part shade. A few varieties like a sunnier situation. They are trouble free under good cultivation. 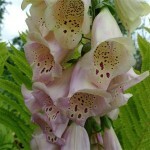 Our native foxglove Digitalis purpurea is the best known in cultivation. There are 25 other species and distinct geographic or varietal forms found throughout Central and Southern Europe. The last few years have seen a tremendous increase in the popularity of foxgloves; unfortunately this has caused a rash of trendy names for plants, some of which are already known in cultivation.